The journalism I like – and do – best is reportage: go to interesting places; meet interesting people doing interesting things; write about it, hopefully interestingly. 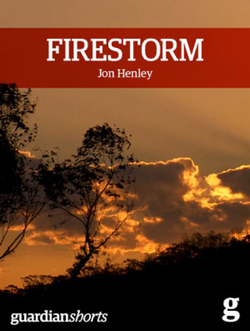 For the multimedia production Firestorm and its accompanying ebook (left), I went to Tasmania to discover what happened to a small town and its residents the day it was hit by a catastrophic bushfire – and how climate change is now making such fires both more frequent and far more devastating. I've travelled to the most remote inhabited island in Britain to learn what life is like for the 20-odd people who choose, remarkably, to live there, and to French Guiana – 90% impenetrable jungle, 15,000 miles from France – to see how its citizens coped with the introduction of the euro. I've spent a week in freezing Iceland as it headed for economic meltdown, and reported from overheated Dubai as its artificial islands looked set to sink beneath the waves of the same global financial crisis. In the wake of the crash, I've told the stories of Greeks suffering from austerity overkill, and sought out Europe's 'lost generation' of young graduates, deprived of the jobs and futures they were promised. Thirty years after the Berlin Wall came down I went in search of its remnants. Fifty years after Lego was launched, I visited the town where it was born. I have been to a groundbreaking Dutch retirement home pioneering a new way of treating dementia, and to a remote Norwegian valley whose inhabitants have – until now – been stuck for half the year where the sun don't shine. A decade ago, when Tony Blair committed British troops to the invasion of Iraq, he told parliament that one of his reasons for doing so was that wherever he had sent them before, they had made things better. I wondered if this was true, and went to Kosovo, then Sierra Leone, and finally Afghanistan to find out. Closer to home, I have been intrigued by the gradual disappearance of the eel, the reappearance of the otter, and the decline of greyhound racing. I've explored what it is about Scotch whisky that has seduced the world, and how the Brits are rediscovering their beer. I've got up early to spend the morning with the team of BBC Radio 4's Today programme, and stayed up late with the staff and clients of a tattoo parlour. I made a whole series of audio slideshows about traditional crafts at risk: the few remaining people still earning a living from making Sheffield pocket-knives, turning bowls on a pole-lathe, working in stucco or carving wood. And I wrote a prize-winning piece about the great age of Do-It-Yourself in Britain and unarguably its finest ever practitioner, my Dad. Along the way, I've met some fascinating people: Jens Breivik, troubled father of a Norwegian mass-murderer; Henning Mankell, creator of Swedish detective Wallander; Karyn McCluskey, diminutive destroyer of Glasgow's gang culture; the remarkable – and now, sadly, late – psychoanalyst Hannah Segal. And some glamorous ones, too: Emmanuelle Béart, Audrey Tautou, Nathalie Baye. Before all that, and quite a long time ago now, I was the Guardian's correspondent in France for nearly 10 years; I enjoyed myself at the expense of Jacques Chirac, witnessed the shock success of of Jean-Marie Le Pen, ate some stupendously good meals, and devoted a great deal of time to a car accident. But the biggest story I wrote from Paris was about an underground cinema. Before even that, I was a foreign correspondent in Amsterdam, Brussels and Scandinavia. But that was also before the internet, so it's all in shoeboxes.